Exercise for this condition has been proven to be very beneficial for circulation and pain control. Individuals who have neuropathy have experienced an over sensitivity in the hands and feet which results into inactivity. When we have inactivity there is a higher chance of weight gain or even loss of flexibility. The pain that some individuals describe in the feet are “like walking on hot coals,” “pins and needles” or they can’t feel them at all. Pain can stop you in your tracks, so the motto of keep moving is discouraging. Individuals find themselves in a vicious cycle of no sleep from pain, no energy from no sleep because of the pain, therefore no energy to exercise because I hurt. 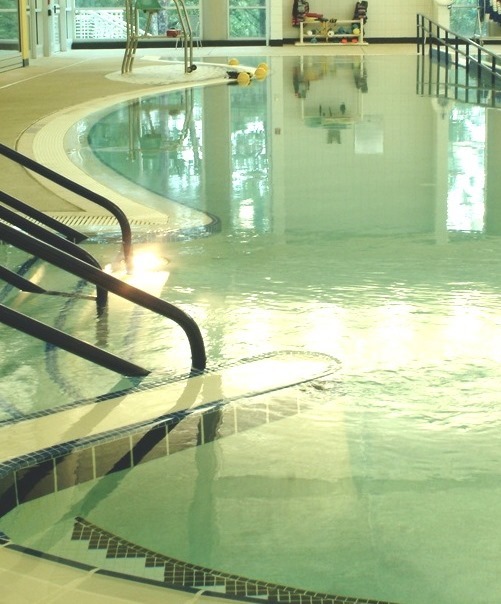 Exercising in a warm therapy pool (92-94 degrees fahrenheit ) for pain management is the key. The properties of the warm water facilitate circulation by increasing blood flow. The warmth of the water calms the nervous system allowing the body to take a deep breath. The hydrostatic pressure of the water at a depth of the chest encourages a gradient flow to the body’s tissues. The flow increases the oxygen level in our tissues. The more oxygen we can move through our body, the healthier our nerve tissue becomes and a decrease in pain is achieved. Physical activity functions to keep the body in balance, supporting organ health and gives us an overall sense of well-being. Take the leap and step in the water. Start off slow and steady with directional water walking, forward, backwards and sideways. Some pool bottoms may have rough concrete, wear protective foot wear in the pool especially if the sensation has decreased in your feet. Balance exercises are good for the pool because the risk of falling is lessened. Add in 2 sets of 10 calf raises and knee raises for leg circulation. Remember before any physical activity, check with your doctor first. Enjoy your time stepping in the water. Considering how cold it is the warm water sound very refreshing. Windy, thank you for your post and the science behind why water feels so good and is so good for people experiencing neuropathy.